What could bring together thousands of young girls to camp out and wait for hours just to get a ticket to a concert? The British-Irish boy band One Direction. The group is famous for winning Simon Cowell's X Factor UK. "They are amazing this is my future husband Perry," said North Texas fan Whitney Sanders as she shows off a poster of the group. But it wasn't all smiles earlier this week, cell phone footage shows the scene of utter chaos as girls rushed inside the Barnes and Noble store at Stonebriar Center Mall in Frisco hoping to get one of 2000 tickets be given out. 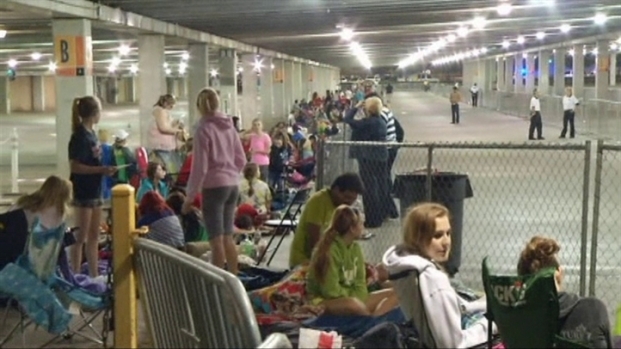 Ten thousand fans camped out overnight hoping to get their hands on a CD and ticket to see British-Irish group One Direction perform in Frisco next week. Several girls were injured, one of them taken to the hospital. But organizers decided to move the concert to a larger venue, which meant handing out an additional 5-thousand tickets. Giving some fans like Holly Keating a second chance. "I was here for 13 hours on Monday and didn't get it, and then I was here, I got here at 2 so here four hours, pretty good you know... every-things good," said Keating. And it was all good in terms of safety. Additional Frisco police were on standby, they even set up a medical command center, had additional mall security, and placed fences strategically under the parking garage to keep the fans in line. "Everything was more organized I got my poster and I can't wait to see them!" says one fan. "I think it's going to be kind of indescribable I'm just going to be so, so, so excited I can't wait," said fan Whitney Sanders. But they will have to wait the concert isn't until next Saturday, March 24th at 1pm. Doors open at Noon and it will be held at the Dr. Pepper Arena.